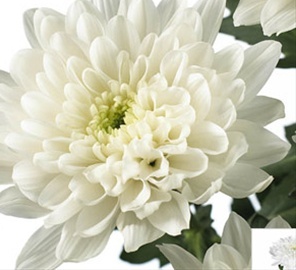 - Great substitute for the old Polaris variety which is more cream than white. Long lasting, ALL disbuds or spray poms last up to 10 to 12 days. 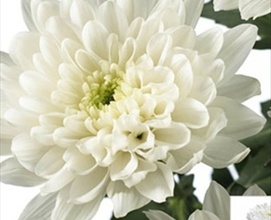 Disbuds are single large blooms, and Spray Poms have multiple smaller blooms per stem. Both types are available across 6 major bloom structure types. Daisy, Cushion, Spider, Button, Anemone, and Micro. Each stem of Pom should have a minimum of 4 to 5 blooms and bunches should meet all grading requirements ( see below). Foliage must be dark green and free of marking or yellowing. Interesting new varieties and colours are introduced each year. 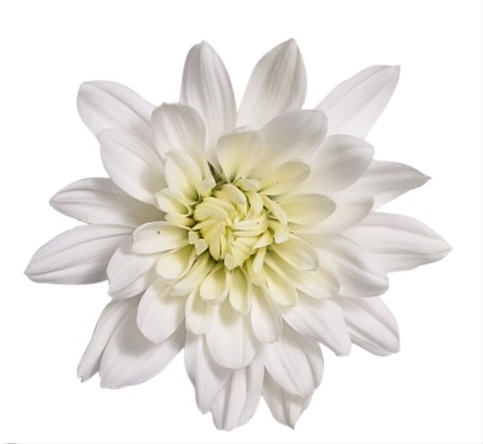 Santini's are a series of smaller bloomed varieties available in a wide variety of fun colors and shapes. 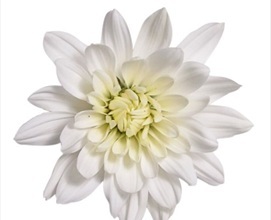 South America grades minimum 6 to 7 stems , 280 grams , 35 blooms per bunch. Minimum stem length 75 cm. 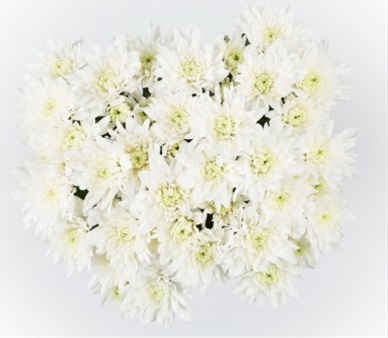 Many farms now offer "bouquet grade" poms which contain a fixed count of 10 stems and a minimum of 50 blooms. "BQ grade" poms are often shipped at 65 cm stem length. Holland grades by stem weight and usually bunched by 5 stems. Should be shipped with 2 to 3 open blooms per stem. Leading Breeders (2010) : C.B.A, Deliflor, Dekker , Fides, Royal Van Zanten, and Yoder Bros.
Assorted boxes of daisy or cushion types should be packed approx 50% white, 25% yellow, 20% pink, 5% novelties. Assorted boxes of dutch novelties should contain 50% pink, 30 % yellow, 15% white, 5% novelties. Color assortments must be adjusted seasonally with more white for Xmas , bronze for Fall, and more lavender for Spring. There is increasing demand for novelty red / bronze varieties on a year round basis and these should not only be planted for the Fall season. 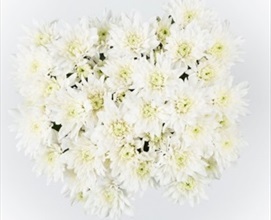 Bunches should be well hydrated before shipping as chrysanthemums dehydrate easily in transit.